Eleanor E. Eidenberger, 92, of Johnson Street in Port Washington died Thursday, June 19, 2003 at Columbia-St Mary’s Hospital, Ozaukee in Mequon. 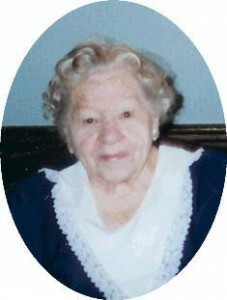 She was born February 6, 1911 to Theodore and Leona Fitrzgerald Reiter in Port Washington. She started working at the Port Washington Chair Factory when she was 13 until it burned down. She married Lester M. Eidenberger of Port Washington on June 18, 1938 at St. Mary’s Church in Port Washington. He preceded her in death on July 22 1987. Eleanor will be remembered for her handmade crafts and delightful bows that adorned her gifts and table centerpieces. She was considered a great cook by many and became a caregiver to many family members throughout her life when they became ill.
She is survived by niece Marlene (John) Kultgen, nephew Mark (Lonne) Schreiner both of Port Washington other nieces, nephews, sisters-in-law Ellen Reiter of Port Washington and Francis Reiter of West Bend, brother-in-law George Schreiner of King, WI, other relatives, the “McDonalds Gang” and friends. She is preceded in death by her husband Lester, sisters Natalie Schreiner and Irene Barsch and brothers Neil and Art Reiter. Cemetery rites 10:30AM Sat. June 28 at St. Mary’s Cemetery Chapel, Port Washington. Rev. James Ernster, celebrant. Masses or memorials of choice appreciated.